As mentioned in my earlier post gnuNify was held on Feb 19th and 20th 2010 at Symbiosis Institute of Computer Studies and Research, Pune. Aditya and I had submitted two CFPs each and all of them were selected. My first CFP was a talk on Get going with CakePHP and the second one was a 4 hour workshop on CakePHP. GNUnify was my first ever open source conference and I made sure I am well prepared for my presentations. We reached Pune on 18th Feb and despite being late night arrival, two SICSR students came to pick us up from the airport. 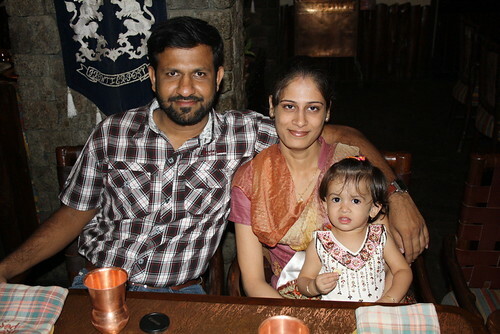 We were accomodated at Symbiosis Vishwabhavan’s guest house which was no less than a star rated hotel. I had both my sessions the next day i.e. 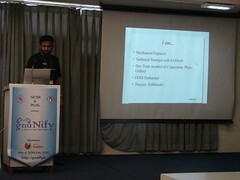 19th Feb.
My first session on 19th Feb was a talk on CakePHP at 11 am. Audiences turned up decently and some of them were very excited to get insight of CakePHP framework. My talk included the introduction to web framework and cakephp, history of cakephp, features and MVC in cakephp. I had designed my slides the way so that I can continue the discussion in the workshop scheduled later that day. I believe people got engaged during my talk and they all were looking forward to attend the workshop. There were some interesting questions after the talk. The second session, a workshop, started at 3:30 pm and most of the people who were present at the talk turned up for the workshop as well. In the workshop we did the basic blog tutorial along with authentication using the Auth Component and model relationships. It took me more than 4 hours to do it and people liked cakephp so much that they were ready to bake some more models and controllers. I met some wonderful people like Kushal Das, Vivek Khurana, Arun Khan, Dr.Ajit Kumar, Senthil Kumaran, Baishampayan Ghose, Amit Singh, Gautam Rege, Shantanu Oak and many others. They were all experts in their respective fields and presented some great talks and workshops. The only thing which concerned me was the low audience turnout for the all the sessions. I think this was because they got divided into different halls as 7 tracks were going on simultaneously. View more presentations from Abbas Ali. GNUnify is an annual gathering of the techies. It is organised by the students of the Symbiosis Institute of Computer Studies and Research (SICSR) in association with the Pune GNU/Linux Users Group (PLUG) to provide a platform for exchange of ideas and knowledge among the industry professionals, students and academia. This year’s event has been schedule on 19th and 20th Feb 2010. I had submitted two CFPs and both of them have been selected. This will be my first ever gnuNify. In fact this is going to be my first ever public speaking and I am really looking forward to it. Check out the entire list of sessions and the schedule forÂ 19th and 20th Feb 2010. Looking forward to have a wonderful time and meet new exciting people from the open source world. I would say this is somewhat a global problem. I am not saying that a framework is the only answer to this issue but people need to follow the new ways of programming and creating new website for different businesses. They need to learn new programming patterns and keep up with the latest trends in the world. What people are looking for now are new places to shop. Many people love shopping online so if you’re one of those people, then check out these free shipping codes for your next shopping spree. We, at SANIsoft, always thrive to learn new programming techniques and the bleeding edge technologies. Gone are the days when we used to do that old fashioned programming. I am planning to conduct more workshops on CakePHP in the upcoming 2010 meetups. 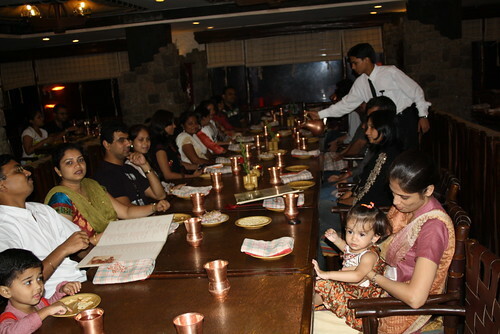 We started PHP Meetup at Nagpur back in July 2009. We are conducting the meetups regularly since then and upcoming December’s meetup will be the 6th edition. We have had talks and presentations on different topics like Web Security, Introduction to PHP Frameworks, live demonstration of SQL injection and content management systems to name a few. The talks were mostly targeted at beginners of PHP. I will be delivering a workshop on CakePHP Framework in December’s meetup which is scheduled on 5 Dec, 2009. This workshop will be the first of its kind in Nagpur where a real world application will be built using CakePHP. This will be a very good opportunity for all those PHP programmers who want to learn CakePHP and see a real world application being built right in the front of their eyes. I expect all attendees to have some basic PHP and web development knowledge. Though I won’t discourage the absolute beginners. They are also free to attend. There will be more workshops on CakePHP at later meetups but this first workshop will be targeted at cakephp newbies. To attend the meetup please mark your RSVP on the event page. Meetup date – Saturday, 5th December 2009. Location – Jog House, F-40, Tatya Tope Nagar, Behind Tatya Tope Hall, Nagpur.